VUDU seems to be one of the stars at the show at CES 2010 this year. A plethora of companies have been showing off new Internet-enabled HDTVs that feature VUDU built-in. This isn’t just great news for VUDU, though – it’s great news for us, too, as VUDU’s service brings with it a whole host of Web apps and social media apps, all accessible directly from your TV. Tweeting from your telly? You can now. 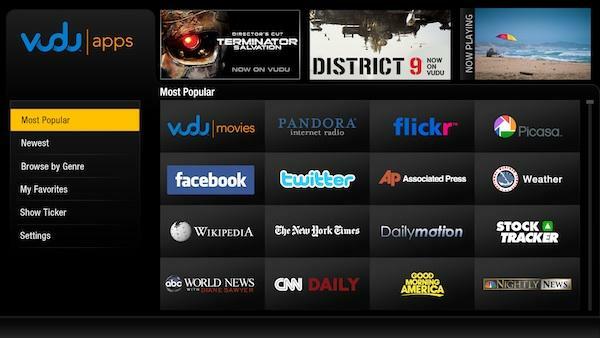 The list of apps on offer from VUDU is long – 115 apps long, in fact (Engadget has the full list). These apps will let you Tweet, update your Facebook status and check up the antics of your friends, manage your Flickr photos and groups, and listen to the tunes you want to listen to, all from your TV. It’s a real sign of how social media apps are integrating into our daily lives, and VUDU have managed to position themselves right in the heart of this new trend. The VUDU interface is pretty slick, too, so I can see this service catching fast. By next year, expect every new HDTV to feature if not VUDU, then some other social media-related service built-in.